Surprise! It’s a Buyer’s Guide on Tuesday and we’re here to help you choose the correct desktop format for the programs you use. Many foundries give you the choice between formats and you’ll want to keep in mind the programs that you will be using the fonts in daily. Although Microsoft Word 2010 supports some OpenType features, not all characters can be accessed if the font has a massive amount of alternates. For example, trying to access all the alternate swashes in Feel Script in PowerPoint would be painful. Don’t do it. Also, you’ll only be disappointed further because OpenType fonts don’t embed well in PowerPoint. Buyer’s Guide will resume at its normal schedule next week. Many foundries like to give you an option to license a font in different formats and customers always ask which format is better. The answer is that your decision should be based on the programs that you will be using the fonts in. Here are some suggestions on choosing the right desktop format. If your workflow includes Microsoft Office programs, like Excel and Powerpoint, then we recommend licensing TrueType formats over OpenType. And if the font doesn’t have a TrueType version, contact us and we can suggest an alternate typeface that may work for you. Last week we went over the Character Set tab and how you can view OpenType features that are available within a font. 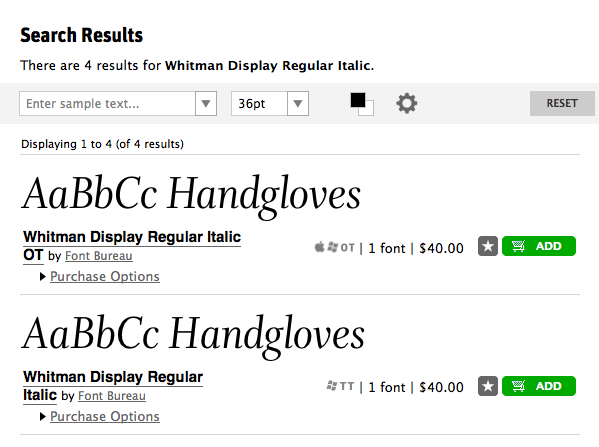 But did you know you can test OpenType features in the Custom Sample Tool Bar? To access the additional controls, click on the gear icon located on any page that shows renders. Then read up on how to use OpenType Feature Controls here . TrueType (.ttf) and TrueType-flavored OpenType (.ttf) work best in Microsoft® Office. Typically, PostScript-flavored OpenType (.otf) contain additional features and glyphs that apps like Excel®, Word®, and PowerPoint® can not access. Also, PowerPoint® only allows TrueType fonts to be embedded into a saved presentation. So when you are purchasing a license for a font, make sure that you are getting the correct format. You’ll want to select PC TrueType or TrueType-flavored OpenType. Any font that has a TT icon is a TrueType font and you can use the legend below to help guide your way through the different formats on FontShop for all the products we provide. Don’t worry, TrueType works with Macs and choosing the correct OpenType-flavor is easy! OpenType fonts are usually the best option, as they work on both Mac and PCs. However, not all applications are “OpenType-savvy”, so there might be some cool OpenType features like swashes and stylistic alternates that you may not be able to access if you don’t plan on using design tools such as Adobe Creative Suite programs. TrueType fonts are a better choice if you plan on using Microsoft Office programs such as Word or Powerpoint. MS Office programs have little to no support for OpenType and tend to have issues accessing those cool swashes you want to use. PostScript fonts are a legacy format that tend to cause issues on newer computers, which is typically why we suggest choosing OpenType or TrueType whenever possible. PostScript fonts are computer specific, meaning they will only work on either a Mac or PC, not both. Webfonts cannot be installed on your computer but are instead used in coding for websites, typically using the @font-face CSS rule. While browsing the fonts on FontShop, you’ll notice that they’ll have some kind of indicator of what format they’re available in, similar to the icons in the Font Format guide above. Buyer’s Tips: Choosing an OpenType Flavor. Did you know that OpenType comes in two flavors? PostScript-flavored OpenType fonts have .otf endings and TrueType-flavored OpenType fonts have .ttf endings. Both flavors are cross-platform and can be installed on either a Mac or PC. TrueType-flavored OpenType fonts will have an OT/TT badge and are optimal for programs— such as PowerPoint and Excel— that do not fully support all OpenType features. While PostScript-flavored OpenType fonts will have an OT badge and works best in programs—like Adobe InDesign —that can support all OpenType features. So if you are working with a client that uses MS Word and you recommend that they license an OpenType version of the font, please make sure that you let them know which flavor is best. We have a great post on FontFont’s OpenType formats you should read if you’re eager for an in-depth explanation that uses FF DIN as example. In our first newsletter of the month, we announced some new fonts from Letterbox: the chunky but energetic display faces Brunswick Black and Gordon Black, and the curiously mechanical monoline script Terital United. Terital, originally conceived as an all-lowercase script, wasn’t entirely new — FontShop originally announced its release in December of 2009. But since then, designers Wendy Ellerton and Lan Huang completely revised the typeface, with two sets of caps (standard and swash) and by combining the three variants into one single OpenType feature-laden gem — thus United. Berber is a strong, narrow, block-style sans serif. While typically meant for use in larger applications like signage, this recent incarnation of the the typeface increases its legibility in text settings. Berber Text now comes with Small Caps, while the King Caps variant offers some great underlined ligatures. Central European language diacritics have also been added to the family. Download Berber Specimen PDF (532 KB). Kevlar is a set of interesting hybrids. The Regular and Bold weights, similar to TypeTogether‘s Bree, are sans serifs with a distinct scripty vibe. Kevlar Slab meanwhile is an upright retro display script, like Michael Doret‘s Deliscript, which acts as a nice and extreme display option for the family. Figure variants have been added to all three styles. Download Kevlar Specimen PDF (537 KB). Another upright script, Bisque is a unique blend of quirkiness and elegance, combining the coolness of geometric form with the warmth of unexpected and organic loops and glyph connections. The two weights are packed with contextual alternates and language diacritics, which are nicely illustrated in the specimen PDF. Download Bisque Specimen PDF (516 KB). Head over to the Letterbox foundry page to see the whole collection. Images courtesy of the Letterbox website. In May, we announced a complete overhaul of our custom sample text toolbar. Phase One included the introduction of our sample text selection menu, and our new color selector. Today we’re happy to introduce Phase Two: OpenType Feature Controls. 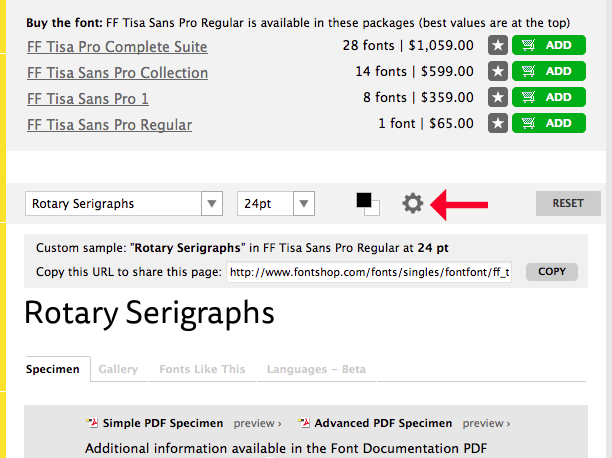 In the sample text toolbar on any page displaying font renders, you’ll now see a new gear icon. Upon clicking the gear, a control panel will be expanded, as seen above. This panel includes a predefined list of OpenType features most commonly included in OT fonts, as well as a few dropdown menus containing additional features that are grouped by relevancy. Note that on single font pages, like that of FF Chambers Sans OT Regular, features that are not included in the font will be grayed out and unselectable. Please note that not every selectable OpenType feature will affect your rendered sample. Most OT features only affect a subset of characters within a font, and if they are not present in your sample string, no glyph replacement will take place. You can view which glyphs are included in each OpenType feature by clicking the Character Set tab on a single font page and selecting a feature from the list. You can also learn about each feature by hovering over the feature name. Just as with the color selector, the OT feature controls can be collapsed using the Hide Controls button. Unlike the color selector, your selections will not be persistent when navigating through to other font pages, as each font will have differing available OT features. While we’re very happy with the status of the OT feature controls and wanted to let you all get your hands dirty with it, we are still working out some of the kinks. If you notice anything awry, let us know in the comments.